American Forward Arnold Louis (201-F-90, agency: HMS) had a great game in the last round for top-ranked Las Animas, receiving a Interperformances Player of the Week award for round 19. 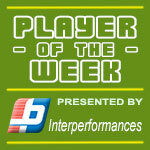 The 28-year old player had a double-double of 28 points and 11 rebounds, while his team beat CDE Esp. Talca (#5, 6-14) 105-97. It allowed Las Animas to consolidate first place in the Chilean Liga Nacional. They would have been even better if they hadn't lost a few games earlier this season. Las Animas has a very solid 15-5 record, but they cannot be too comfortable about keeping top position. In the team's last game Louis had a remarkable 53.3% from 2-point range. He turned to be Las Animas' top player in his first season with the team. Former Savannah State University star has very solid stats this year. Louis is in league's top in points (7th best: 21.5ppg) and rebounds (6th best: 10.6rpg). 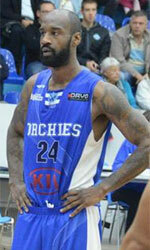 The second best player in last round's games was 29-year old American Darnell Dodson (201-F-89) of Osorno. Dodson had a very good evening with a double-double of 34 points and 12 rebounds. Of course he led Osorno to another comfortable win 87-74 over slightly higher-ranked CDE Esp. Talca (#5, 6-14) being unquestionably team leader. Osorno's 6th position in Conferencia Sur has not changed. His team is not often considered as one of the league's best with a mere 8-14 record. 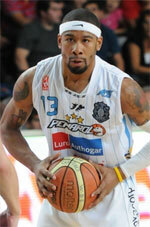 Dodson is a newcomer at Osorno, but is already one of team's top players. He belongs to the best scorers in the league with 23.5ppg (#3). He also registered 12.5 boards per game. Third on the list of top players last round was another Osorno's star - Brazilian center Dida Pereira (202-C-92). Pereira got into 30-points club by scoring 31 points in the last round. He went also for thirteen rebounds . Despite Pereira's great performance Osorno lost 73-83 to the higher-ranked Puente Alto (#3, 11-10). But his team cannot count on just these two top stars as they also need help of the other teammates. The chances of Osorno not to end season at such low position in Conferencia Sur, however are less than slim as they have already lost 14 games, recording just eight victories. With bigger assistance of his teammates, Pereira could try to bring Osorno's a little bit higher in the standings. Pereira has a very solid season. In 20 games in Chile he scored 18.5ppg.